Passion identifies itself into the art of film making to the young producers Sudhan Sundaram,Umesh,Jayaram,and Arun Vaidyanathan of Passion Studios. They sailed their way to success with their maiden venture “Kappal” , and are in the process of giving the final touches to “Nibunan” starring Arjun and directed by Arun Vaidyanathan. Their search for excellence in content continues with the official announcement of a project that is sure to raise eye brows.Vijay Sethupathy and Director Balaji Tharaneetharan join together again after “Naduvula konjam pakkatha kanom” believed to be a trend setter of unique and content ridden films to give an other film that is tipped to earn praises for the novelty in script making. Vijay Sethupathy who is on a glorious path of success thanks to his choice of scripts and good will that goes beyond his capacity of being an actor adds special attachment to this film titled ” Seethakathi” as it happens to be his 25th film . ” Excited indeed! Words of expression are few when a sort of reunion happens beyond emotional connect. 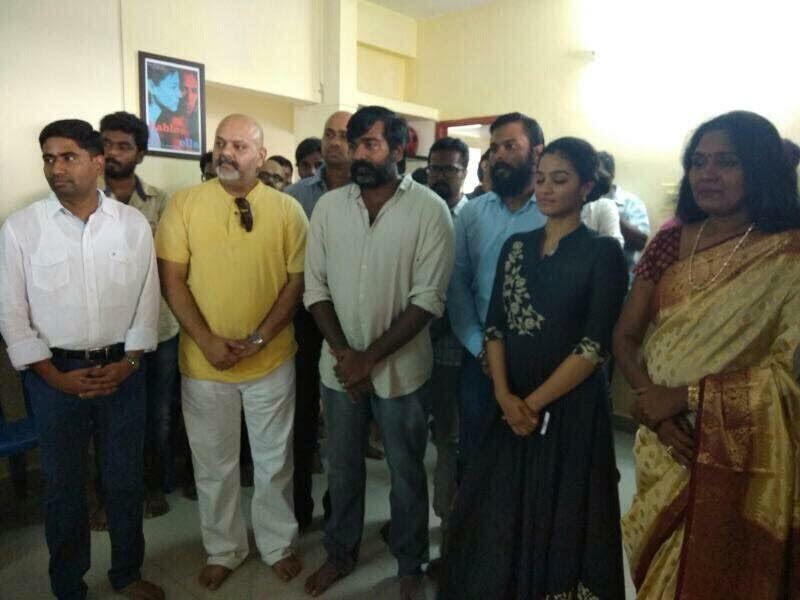 Vijay Sethupathy fits himself as “Seethakathi” as his birth right.We are aware that the expectations will be very high and we are equally confident that this film will match to the expectations .This script needed a production company with passion and passion studios are here to present a film that is sure to be discussed for a long time.The shooting will be commencing from 24 th of April.” Concluded Director Balaji Tharaneetharan.